I must admit that I’m lucky to learn mindfulness meditation from a great teacher at an early age. Regardless of whether you’re trying to overcome anxiety or simply wish for better control of your mind, mindfulness meditation is the key. With that said, it takes consistent practice before you gain any benefits from meditation. 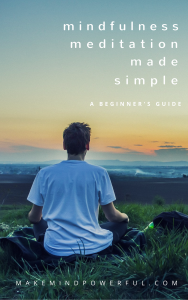 I’ve created this meditation guide based on the word by word instructions from my meditation teacher. If you have any doubts about mindfulness practice, feel free to check out my meditation articles.